Settled into the Alaskan civilization rests a tiny zoo, homing on the most iconic animals in it's confines. Very little funds are provided, so there are only a few exhibits, but what little they have is very well kept. The animals live an easy life as far as a tame existence goes, they only get the best. There are mostly tourists that frequent the zoo, along with it's small staff team. Getting in and out of Northern Trails is easy, no long lines nor time needless advertising there to distract you from the exhibits. CLICK ON NUMBERS TO VISIT DIFFERENT PLACES! - Only the participants to the event related with the place can walk by this place and write. - The rules to follow are the ones exposed in the General Rules and in the guide to do the ritual. - You must want to have fun! (11) Kruse was sitting on the fence that surrounded the wolf enclosure, watching everyone. He was bored and felt like doing what he did best, being annoying. 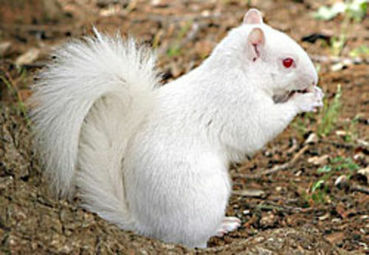 The small white squirrel jumped toward a nearby tree and climbed up it, he looked around for anything small he could throw. He saw a few nuts hanging toward the end of the branch, and he grinned mischievously, and he quietly walked along the branch and collected several nuts, some of which he ate since he was greedy, and he held a few in his front paws, he sat down and watched the animals in the enclosure, and he threw the nuts toward the wolves, a white female, a pregnant female, and the big brown wolf named Strong, it hit him on the head and bounced off. The squirrel laughed and jumped from the tree back onto the fence, before smiling at the wolves "Hey dogs, having fun in there?? by the way happy birthday big brown wolf, just gave ya a present see" he said cheekily. 11) Dex, the pesky brown squirrel, scurried through the wolf enclosure. He climbed up one of the trees by the enclosure and listened to their conversation. Apparently it was Strong's birthday. He hummed to himself quietly and then scurried over to the albino squirrel names Kruse which was by the group of wolves. "What? It's your birthday? Well what are we waiting for, where's the party?" He said in his speedy voice. "You can't be gloomy for your birthday." He said and looked around for something he could give to Strong. 11| Loki stirred from his slumber at the voices of his fellow pin mates. He grumbled to himself as his dark brown eyes slowly flickered open. A sigh escaped him as he pushed his large paws forward to sit up and then to stand. He shook his pelt free from debris and dirt. He stretched his leg muscles and let out a yawn. Once finally waking up, he padded over to the group of wolves. "Hey..." He mumbled, still trying to shake the drowsiness off. "What's going on?" He asked, noticing the squirrels being lively and the others talking quiet a bit. 11- The arctic female wolf looked up the cage's fence. She saw way many too squirrels. "Oh, friends!" One albino squirrel took Moon's attention. "Oh, you're white just like me!" She smiled and wagged her tail. "But you got pink eyes, he, he." (11) Kruse grinned at the white wolf and jumped down from the fence onto her head "Of course, i'm only the handsomest white squirrel you ever set your eyes on!" he boasted, sitting on his rump with his front paws in front of him, while looking at the wolf's muzzle, he poked her nose and grinned "Way more handsome than the other squirrels, of course thats true since im white and awesome, they're all boring and the same!" he said with a cheeky smirk, grinning mischievously toward the other squirrels. "I was thinkin of making this big brown wolf a gift" he whispered to the white wolf. "Y'know, since im nice like that" he said with a grin. 11- Moon grinned back to her new white friend. And when he jumped on her head she laughed. When listening the speedy voice on her head she smiled. "Of course you're special." She winked. "To be white is cool." She smiled at the squirrel and whispered back: "Yush, ysh, you're good. His name is Strong and he's like my brother." The arctic wolf smiled. "When we were free we were in the same pack. Actually he was the dominant and I was the agent hunter. And I was to make him gift too, but I am not shore what to be. And my mane is Moon, my albino friend. What's yours?" (11) Leta carefully listened to the others talking to each, considering that the main subject seemed to be Strong, the large brown wolf. She glanced around the enclosure, pondering as to what the others animals were thinking, however, whilst glancing around she noticed a white wolf and a white squirrel, creating interest for the small brown rat. She scurried closer to the two animals, wondering if she would be permitted to join in with their conversation, though either way, she entirely bothered - all she wanted to do was interact with at least some of the animals around here to prevent herself from being bored, and possibly learn more about what could take place for Strong's birthday. (11) Whilst awaiting for some sort of possible reaction from the two white creatures as she walked closer, the female twitched her whiskers and directed her eyes over to a wolf who had just awoken, questioning as to what was going on. 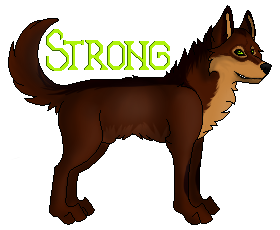 However, Leta said nothing - she wasn't entirely interested with providing the wolf with an answer, particularly since she wasn't entirely sure what was going on herself, other than the fact that it's Strong's birthday. The male flicked her tail and carefully observed the wolf with her small brown eyes whilst still keeping an eye on what was happening around her from the corner of her eye. 11) Anila yawned and groomed her swollen belly. 11| Without a moment to spare, Loki turned his attention to the female wolf. He scanned her over, she was looking more ready to birth the pups than she had a few weeks ago. "How are you doing Anila? It looks as though you've almost reached your due date." He said, giving the fae a brief smile. Pups were always something to be excited for, even in an enclosure. He glanced over towards Strong. "So I hear it's Strong's birthday. Has anyone planned anything yet?" He asked, hoping she would provide the brute with more info. 11) The male was confused as ever, no one was telling him anything. But he heard someone mention "Strong's birthday" so he chimed in "Who what who now???" He didn't understand the event going on. 11) He opened his as he must have dozed off. More animals have came into the encloser which made he feel a bit uncomfortable. Zo-Zo began to think of what he could get Strong as a birthday present, but came up blank. He scurried along and climbed the tree in the pen to get a better view of the area. 11- Strong was listening to his friend Moon, he also could not understand the purpose of the humans on having them locked up there. In answer to what Moon was asking he said "The only thing that I know, my young friend is that to be locked up is not a good sign" he looked back where was the humans and continued "what interest can have on us.. ? surely none beneficial to us" a pause and Moon had redirected the conversation to his birthday, Strong laughed and replied "What I want you to do?" he repeated her question and then said "How about, try to get us out of here?" and continuous with laughter. His thunderous laughter stopped when Anila approached, then Strong give the greeting to she as an equal "Hello" and looked at his belly, it seemed that all was well. After a while she saw that the two females keep whispering things between them, then Strong thought 'bleh.. are things of she-wolves' and began to contemplate the landscape showing great indifference. Not long after, Karis, a she-wolf that was worthy of her breed and definitely a good example for the zoo approached to give the happy Birthday "Thanks Karis, well.. I feel a little more elder but as I said before to Moon I do not know if is for my inactivity or what" then his small furry tailed friend said something about going to explore the Zoo and then after a few quick words gave him a little friendly punch "Hey!" exclaimed and watched the squirrel ran in circles, that made he feel happy for a while since this liberated his boring life for few seconds. "But Moon is right, Zo-Zo" he said, looking into the eyes of a different hue of the white wolf "But no for the danger, if not more well because I do not see any way to escape" he did not care what might happen if he leave, since for him being there enclosed was worse than death, and if there was a way to go out would certainly be the first to venture to escape. A blow to his head dissuaded his thoughts "Ouch!" He looked toward the fence and saw a white squirrel, could be neither more nor less than Kruse "That's no way to give the happy Birthday to a beast that can break your head like a walnut!" and then Strong approached the fence where the squirrel was and began to beating the fence. After two punch he calmed down and told himself it was just another blatant joke of the rodent and he leaned on the fence. "Hey Dex" he said when he saw the brown squirrel approaching "Party? I do not think that is the right place for something like that..if you were in my land I assure you that I had organized a great hunt!" he smiled when remembered Denali "I am sad? Well, it's my natural state since I've been here you know" he replied to Dexter "Hello, good morning Loki" replied after observing the wolf yawning and then he saw Maddox coming and he gave a saluting nod when the eyes crossed with him. 11|| Karis grinned, her heart increasing in beat. ' I hope he can't hear that.' She thought. "You must miss your pack, the freedom of being free to hunt and roam wherever you want, she sighed, "I miss that." 11) Zo-Zo stopped running in a circle when Strong replied. "I guess you are right." Then thought for a second. 'The best birthday present would be to help him escape and be back with his pack.' He rubbed his little paws together in an evil way. "So..we should help you escape for your birthday present." He smiled hoping Strong would agree. He needed some action. Kruse grinned cheekily at Strong's reaction "Awh im sorry man, was just playing you know" he said with a chuckle. The mischevious squirrel jumped down from the fence onto Strongs head and smiled "Yah, we should totally do that, help you get out of this dump. Us squirrels know the zoo like the back of our paws see." he boasted, while grinning at Zo Zo. "We could annoy everyone and cause a ruckus that confuses the humans, then we can try and steal their keys and... somehow figure out how humans use them, and you could be free to see your wife and such" he said with a cheeky, 'evil' laughter "It would be alot of fun" he said to Strong, wondering if the brown wolf agreed. 11- Karis' words made to Strong to realize that he never talked about his pack, well he mentioned it.. but he never talked about it on deeply. As well, he also thought that he never has shown interest for the past of the wolves who were coexisting with him. He smiled to Karis and asked "What's about your wildlife in the past, you have a family somewhere?" At that moment he felt that it was time to got to be open to all his cellmates, anyways.. seemed that they would live together for the rest of his remaining life. Now that he started to get used to the idea of remain there the rest of his life, Maddox opened his mouths to, again, give hope of freedom. Then Strong remembered that Coyote who had escaped successfully and his tail began to move 'If a s-tupid hybrid could escape we also can!' But he said nothing about it, although the idea of a plan stayed engraved in his head. Then the white squirrel jumped and touch down on his head, Strong did not mind this action because he was used to wear his friend Zo-Zo on his head a lot of times in a day. In addition, to listen the words of the squirrels directly to have them near to his ears was an advantage to understand them. He listened what the squirrel was saying and he got up happily "Hey, that's a plan that could work if we planned it more in detail!" Karis sighed heavily. "Well it's a long story, but I am an heir to the Eastern Wolves pack, my parents were the Domanint pair and I had a twin sister, Lacien. They were all killed by the Western Wolves, or so I thought, because before I was captured I was in Denali, I found my sisters scent! It about a few miles from where you said you pack was, I kept following her scent, I knew I was close, but then I felt a pin-prick on my hip, it was a dart, I blacked out a few seconds later, and that's how I got here. I miss my family so much; my mother especially, she had such a kind heart.... But you know it's YOUR birthday, you should be hearing happy things not my sob story." Sorry my cousin changed it, but my profiles being fuzzy and won't let me put up my profile pic. And when I try to put the picture here on the forum it won't let me. Lacien wrote: Sorry my cousin changed it, but my profiles being fuzzy and won't let me put up my profile pic. And when I try to put the picture here on the forum it won't let me. Munik had long since nearly fallen asleep on his perch, probably almost falling off the fence more than once. As consequence, when he awoke, he had to fight to keep his balance for a second, before regaining it and looking around the enclosure like nothing had happened. He saw that wolf friend of his, Strong, conversing with another canine, and ruffled his feathers at their odd voices, which were louder still to his tired brain. The raven clacked his beak and covered his face in his wings, pecking at the feathers in order to clean them, trying to distract himself and make himself unavailable to conversation. 11- The white female got up and stretched her muscles. Moon glanced over the place to get know with the changed atmosphere. She took out a big yawn and asked -> "Oh, what time is it?" The fae smiled. "Why you didn't wake me up? There is anything else to do in this cage." Moon sighed. "Only sleep. Deep, deep sleep. To drive away the reality." The white wolf yawned again in boredom and moved closer to Strong and the other wolves. "Excuse me, but what are you talking for?" Coconut sniffed the cage bars before he squeezed his fat body through them. "Hey guys!" the overly plump squirrel said with a large smile. The black squirrel then ran over to Brook. His nose twitched as he looked at the wolf. She was a good friend of his, and he was always happy to see her. He was fattening up for winter too.